If one is looking for a full fledged family SUV that weds comfort with practicality and style with performance, Toyota Highlander comes as an excellent option. The 2016 edition of this beast offers no significant changes on the exterior and the interior front apart from a few updates here and there but still appeals on more counts than one. This Toyota Highlander review promises to make you familiar with latest version of this family-friendly SUV that has impressed millions with its power and features. Built on the same platform as Toyota Camry and also known as Toyota Kruger in some parts of the world, Toyota Highlander is classified as a midsize crossover SUV. The vehicle received a major overhaul in 2014 and the changes made to its current edition are minor in comparison. In its current generation, the vehicle is more athletic, more refined and continues to offer the same reliability and functionality as before. Toyota Highlander 2016 offers good bang for the bucks as it is choc-a-bloc with several features in return for an affordable price. The car derives its immense capabilities from a powerful engine underneath its bonnet. It comes standard with a frugal 2.7-litre, four cylinder engine mated with six speed automatic transmission and offering a front wheel drive. The options of a 3.5-litre, six cylinder V6 mill and all-wheel drive are also available. This eight seater hulk is offer in four trims – LE, LE Plus, XLE and Limited. The car has a sleek and good looking exterior that is well matched by a comfortable and spacious interior. What makes it a good choice for families and tour operators alike is its focus on interior niceties and storage along with a decent driving experience and a well controlled ride. The Toyota Highlander review would not be complete without a look at its long list of specifications. Toyota Highlander specs are sure to impress even the hardest of cynics. This one of the most popular SUVs represents the third year of model’s current generation. It packs in enough goodness for a three-row crossover comes with a long list of standard and optional features. The impressive Toyota Highlander specs get even more impressive with the increase in the trim level. The official website of Toyota lists the Toyota Highlander cost as $29,765. It turns out to be around Rs. 19.64 lakh in Indian currency. The car packs in a lot of value in return for the price. The quality materials used in the car along with the long list of standard features dwarf the price factor considerably. Take a look at any Toyota Highlander review and you will notice that the current generation Highlander is much better on the performance front too. It is quieter and offers a more engaging ride than before. The handling too is on the athletic side, a feature that is difficult to find on a large crossover. The front strut and the rear independent suspensions perform their duties well and impart firmness to the ride without even a hint of leanness. Sufficient power is developed by the standard four-cylinder engine but the V6 engine is more potent while also being nearly as fuel efficient. The automatic transmission of the car is known to offer smooth downshifts. It maintains its composure even on aggressive turns. This square shouldered beauty is not very different from its predecessor. Toyota Highlander photos show that it looks more like a typical Toyota passenger car than like a rugged SUV. It comes across as a more family friendly and civilized vehicle than its competitors like Nissan Pathfinder and Ford Explorer. The exterior is aesthetically pleasing without being over the top. The most noticeable change on the Toyota Highlander exterior is the increase in the length. It has been stretched to 191.1 inch and the wheelbase of the car stands at 109.8 inch. The width is now half inch more. 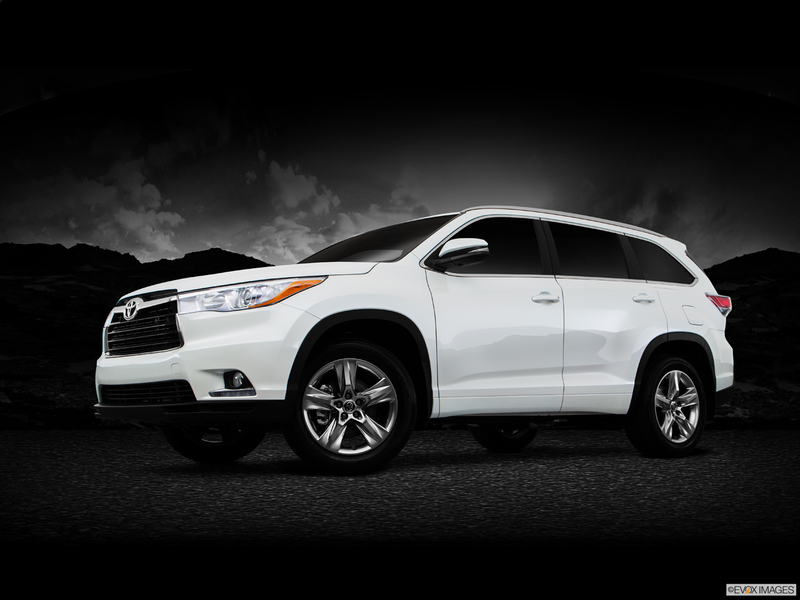 Toyota Highlander features like a maw-like grille and huge wheel wells and sills make it look more like a truck. But that is well balanced by the strong shoulder line and nicely shaped rear. 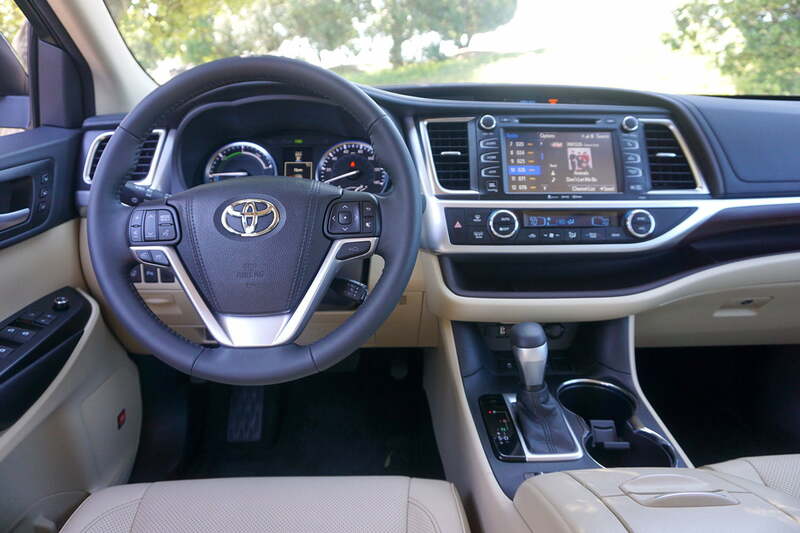 Toyota Highlander interior is on the softer side and makes you forget that you are inside a crossover. When it comes to comfort and frugality, the car is second to none. Depending upon the options, the car offers a seating capacity for eight persons. It offers flexible second row seating in addition to easy access to the third row seats. The front bucket seats are divided by a huge tambour-covered console. Move to the second row and you are welcomed by a three-person spilt-bench seat that offers a reclining function or a pair of captain’s chairs. Also offered in the second row is the sliding feature that helps in comfortable access to the reclining third row seat. The third row lacks adequate headroom though the width has been enhanced by 4.3 inches. The navigation equipped models of the vehicle incorporate a large touch screen that highlights the luxury of Toyota Highlander interior without sacrificing on the visual clarity of the cockpit. 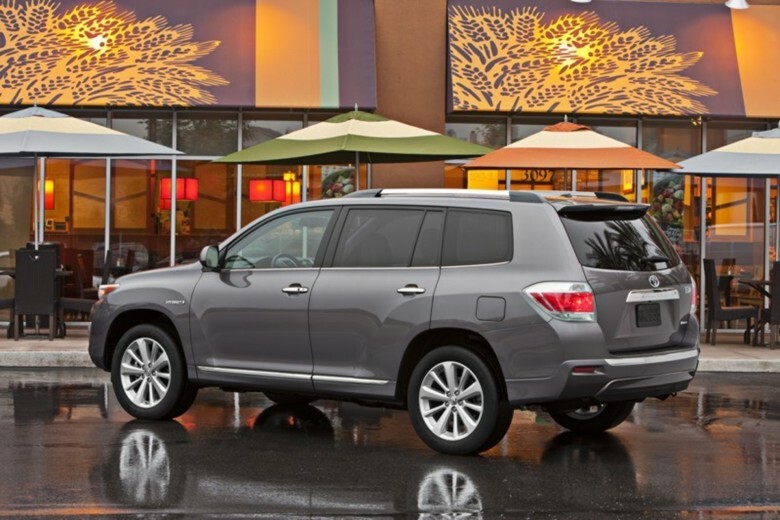 The big easy-to-operate climate control knobs and big gauges further emphasize the comfort factor of Toyota Highlander. Bluetooth, USB port, heated seats and HD Radio are other major interior attractions. The company has packed in a towing package as standard on all the variants of the car for this latest model and has also included heated seats on the LE Plus trim level. The four cylinder Toyota Highlander can easily tow 1500 pounds while the V6 model can tow 5000 pounds with front wheel or all-wheel drive. Rear view camera, USB port, Bluetooth, and Toyota’s Entune infotainment system with 6.1 inch touch screen come as standard features. Interior air filtration, turn signal in mirrors, Dual illumination in vanity mirrors along with front and rear air conditioning make sure to put the passengers in total comfort. It is also bestowed with a range of convenience features like cruise control, front seatback storage, tilt and telescopic steering wheel, audio and cruise control on steering wheel, overhead console with storage, etc. On the safety front too, Toyota Highlander 2016 scores over its previous editions. The re-positioned pillars and the bigger rear quarter windows have considerably improved the visibility to offer a well-controlled and safe drive. It comes equipped with advanced safety features like eight airbags and a standard rear view camera. It is full of driver-assistance features such as lane departure warning, blind-spot monitoring, rear cross-traffic alert, and pre-collision warning. Other important safety features include 4-wheel ABS, emergency braking assist, stability control, traction control, dusk sensing headlamps, daytime running lights, ventilated disc and solid rear disc brakes etc. The NHTSA( National Highway Traffic Safety Administration) has honored it with a five-star overall score with four stars on roll-over protection and frontal crash. It has been named as the Top Safety Pick by IIHS (Insurance Institute for Highway Safety). It can safely be called as the safest car in its segment! Toyota Highlander 2016 locks horns with other bigwigs in this segment like Honda Pilot and Nissan Pathfinder. The 2016 edition of both Pathfinder and Pilot are sure to offer stiff competition to Highlander. While Nissan Pathfinder scores over Highlander in terms of highway economy and interior space, Highlander has an upper hand in the comfort department. Honda Pilot, on the other hand, offers a seriously rewarding driving experience than both these cars but again lags behind Highlander when it comes to interior comfort. Toyota Highlander has a rock solid reputation for reliability. The strong and smooth engine, the refined and comfortable cabin and a serene and compliant ride are things that work strongly in its favor. It hits the right spots for the majority of buyers who are interested in a family-utility vehicle. 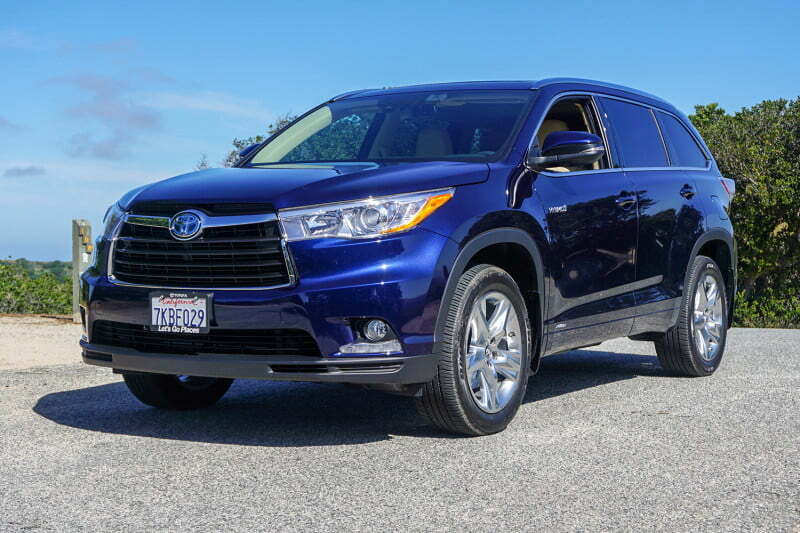 All in all, this Toyota Highlander review clearly puts across the vehicle as a stylish and affordable alternative to the minivan.